Have you been looking for a quiet mountain getaway, surrounded by nature’s beauty? Our 1 and 2 bedroom cabins in the Smoky Mountains are located on 135 wooded acres with a beautiful mountain lake just a short walk away. Our cabins by the lake are perfect for a romantic getaway or family vacation in the Smokies, with everything you could wish for including mountain views, private hot tubs and even an outdoor firepit with gazebo! At Smoky Mountain Lake Resort you can step outside the front door of your Smoky Mountain cabin rental and take a walk down the quiet country lane to spend the day fishing in a beautiful mountain lake. Our Smoky Mountain cabin rentals are just a short drive from Gatlinburg, TN and the entrance to the Great Smoky Mountains National Park with hundreds of hiking trails and beautiful mountain scenery. Take a look at our list below to view all of our unique lakeside cabins in the Smoky Mountains. 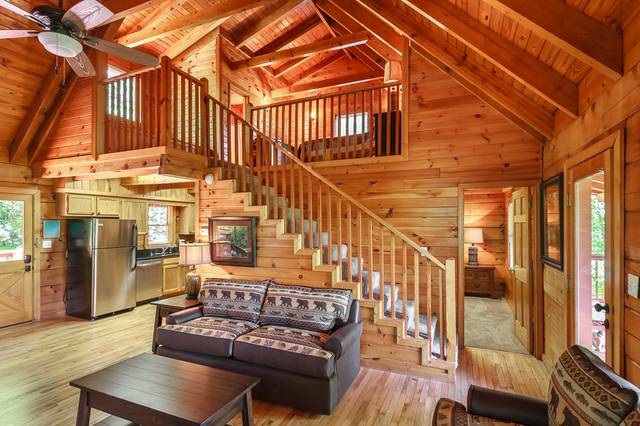 Please call us if you have questions – we’re here to help you find the perfect cabin in the Smoky Mountains! May 2015 completely remodelled! Brand new plantation blinds installed throughout the cabins. Unique mountain lake cabins located only 15 minutes from town but each one very private with hiking right outside the back door. Choose from studios, one bedrooms, two bedrooms for the best fit for you. Located on 135 acres of beautiful Smoky Mountain woods available for you to enjoy. Just a short walk down the country lane to the beautiful mountain lake located on the property. Rustic luxury, unbelievable setting with beauty and nature all around. Beautiful rushing creek runs across the property just a short walk from the lake. Truly away from it all and in the woods in Tennessee. 2015 Completely remodeled! Brand new plantation blinds installed throughout the cabins June 2016. Unique mountain lake cabins located only 15 minutes from town but each one very private with hiking right outside the back door. Choose from studios, one bedrooms, two bedrooms for the best fit for you. 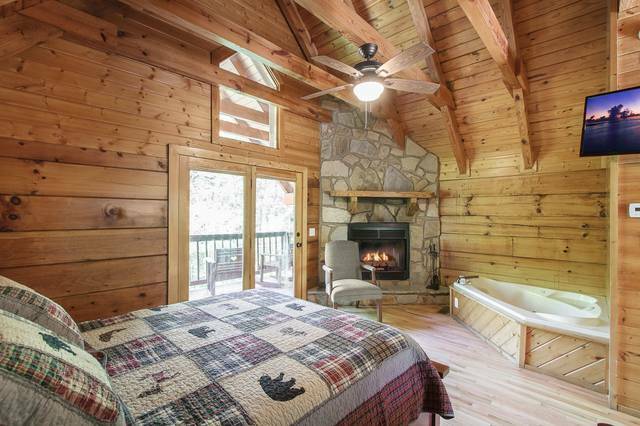 Located on 135 acres of beautiful Smoky Mountain woods available for you to enjoy. Just a short walk down the country lane to the beautiful mountain lake located on the property. Rustic luxury, unbelievable setting with beauty and nature all around. Beautiful rushing creek runs across the property just a short walk from the lake. Truly away from it all and in the woods in Tennessee. Completely remodeled in 2015! Unique mountain lake cabins located only 15 minutes from town but each one private with hiking right outside the back door. Choose from studios, one bedrooms, two bedrooms for the best fit for you. Located on 135 acres of beautiful Smoky Mountain woods available for you to enjoy. Just a short walk down the country lane to the beautiful mountain lake located on the property. Rustic luxury, unbelievable setting with beauty and nature all around. Beautiful rushing creek runs across the property just a short walk from the lake. Brand new plantation blinds installed throughout the cabins. Truly away from it all and in the woods in Tennessee. May 2015 completely remodeled! Mountain view! Brand new plantation blinds installed throughout the cabins June 2016. Unique mountain lake cabins located only 15 minutes from town but each one very private with hiking right outside the back door. Choose from studios, one bedrooms, two bedrooms for the best fit for you. Located on 135 acres of beautiful Smoky Mountain woods available for you to enjoy. Just a short walk down the country lane to the beautiful mountain lake located on the property. Rustic luxury, unbelievable setting with beauty and nature all around. Beautiful rushing creek runs across the property just a short walk from the lake. Truly away from it all and in the woods in Tennessee. May 2015 completely remodeled! Brand new plantation blinds installed throughout the cabins June 2016. Unique mountain lake cabins located only 15 minutes from town but each one very private with hiking right outside the back door. Choose from studios, one bedrooms, two bedrooms for the best fit for you. Located on 135 acres of beautiful Smoky Mountain woods available for you to enjoy. Just a short walk down the country lane to the beautiful mountain lake located on the property. Rustic luxury, unbelievable setting with beauty and nature all around. Beautiful rushing creek runs across the property just a short walk from the lake. Truly away from it all and in the woods in Tennessee. Unique mountain lake cabins located only 15 minutes from town but each one private with hiking right outside the back door. Choose from studios, one bedrooms, two bedrooms for the best fit for you. 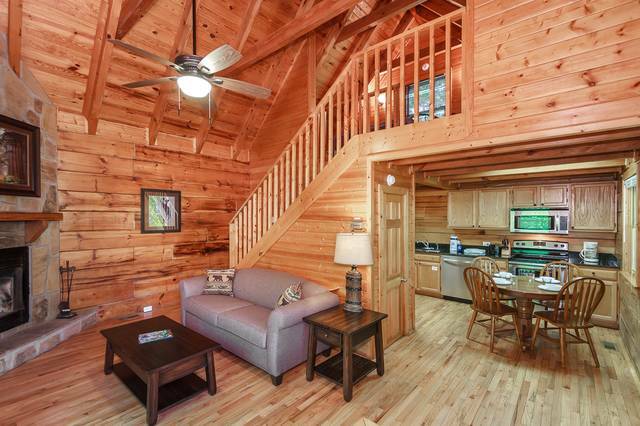 Located on 135 acres of beautiful Smoky Mountain woods available for you to enjoy. Just a short walk down the country lane to the beautiful mountain lake located on the property. Rustic cabins, unbelievable setting with beauty and nature all around. Beautiful rushing creek runs across the property just a short walk from the lake. Brand new plantation blinds installed throughout the cabins. Truly away from it all and in the woods in Tennessee.